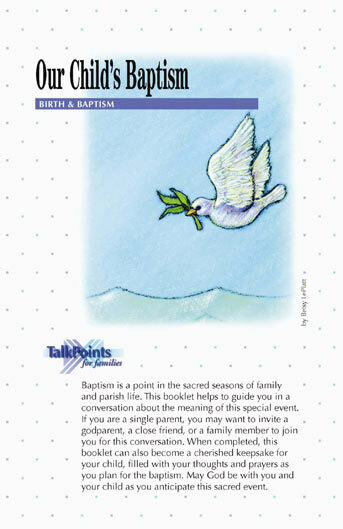 This communication guide for parents makes it easy for them to talk with each other about the importance of their child’s baptism and the meaning of the event. First published by St. Mary’s Press, TalkPoints now distributes this popular and easy-to-use resource. Parents write responses to each of the sentence completions, and then take turns sharing their responses with each other. The completed booklets become a part of the keepsakes the child will one day be able to read and enjoy. The conversations come in packages of 10 and sell for $12.50 or only $1.25 for each family. Order one per family. Here’s what parents said after using Our Child’s Baptism. I felt like I was giving my child a message for her to read in the future. It made me feel close to my spouse. Brings up good points to talk about as new parents. It made me feel close to God. I felt more relaxed about baptism. Makes a couple sit down together and discuss the true reasons for baptism. Very good, clear and attractive. The duplicate pages were clever. I feel closer to my wife. My wife and I share different Christian faiths, and it helped us to discuss the value of both. I felt close to my husband. Concise and easy to read and understand. It was a good tool for encouraging communication and reflection regarding our daughter. Easily understood and easy to complete. We shared our ideas in a positive way. Stimulates good things to think about and discuss. It’s a nice way to break the ice and stimulate conversation. It made it easy to discuss our beliefs. I felt it was helping us to talk about a very important time in our family’s life. I learned what my husband (Lutheran) felt about baptism. We had not explored our similarities/differences in religious understanding of baptism. A special keepsake for our baby. Well thought out – brings closeness. Excellent experience! It made me stop and think. What a wonderful document that will hopefully be read by our child some day. It was an exceptional experience. It’s a good way to make this discussion happen. Very neat activity that helps one to prepare and really think about baptism. It is a useful tool for understanding the meaning of baptism. This is a great way to renew faith as a family. Helps to focus on the sacrament during a very busy time.